Matt East stopped by the tasting facility last week (I really need a tasting facility rather than just a table, fridge and sink), bringing with him two brand-new releases from his Rouleur label (a back story here). Matt’s been busy of late, with more fruit coming on stream this vintage (so more wine) from a few more Yarra Chardonnay vineyards, plus a single vineyard Shiraz and a McLaren Vale Nero d’Avola in the pipeline. He’s also moving in with Rory Lane of the Story, sharing Rory’s winemaking facility in Melbourne. Dave and Nathan from Out of Step are also coming on board as tenants, making it one big Victorian small producer love-in! This year’s release comes exclusively from the Willow Lake vineyard, and is made in a similar vein to last year. Most of the fruit was whole bunch pressed to barrel, but a portion this year was kept on skins for up to five days. 250 dozen produced. There’s an extra richness this year with a slight edge of nougat and white peach. Still, this is a beautifully delicate Chardonnay with a fine grapefruit edge, the acidity putting giving this wine a tight vibrancy that is beautifully refreshing and just on the right side of leanness. A wonderfully well-made Chardonnay in the restrained style. I liked it even more than last year. Best drinking: 2017-2024. 18/20, 93/100. 12.8%, $32. Would I buy it? Well priced and delicious, it’s a wine I’d buy for sure. Sourced from a single block on Trotts rd in McLaren Flat planted in the 60s. ‘For this block one side gives lovely bright fruit and the other gives more tannins. Great tannins on this block‘ said Matt. 300 dozen produced. Lovely bright fruit indeed here. 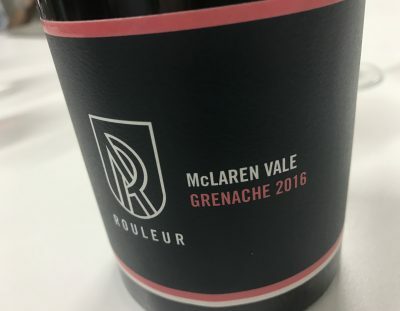 Gee 2016 McLaren Vale Grenache looks good! Lift, violet and berry fragrance – it’s like a Grenache essence, and with gentle savoury tannins to match. Those tannins linger too, in a wonderfully fine grippy fashion. This is great mid-weight wine with energy and structure. Just delicious anytime wine, that should be celebrated for its vibrancy. Best drinking: 2017-2027. 18.5/20, 94/100. 14.4%, $32. Would I buy it? Absolutely.